DEMMEX is a Registered US & Turkish Brand. Amazon Best Selling COPPERBULL Coffee Pots are manufactured by DEMMEX,too. We have a large selection of Turkish coffee pots that are made by experienced artisans in Turkey. 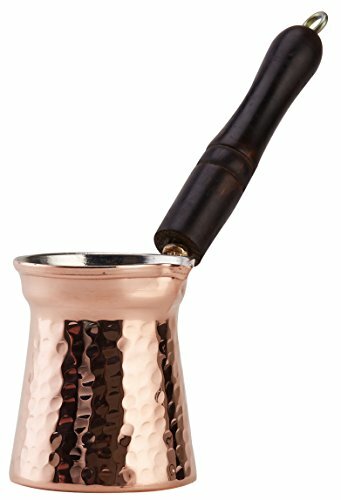 All of our Turkish coffee makers are made with copper and are 100% lead free. Copper is the choice of the gourmet professionals for cooking. It is considered the finest practical conductor of heat. Its primary advantage is that it requires only low to moderate heat to obtain the best results. This is why copper is the perfect material to use for Turkish coffee pots called "cezve" (pronounced " jezz-va" ). With little care, your coffee maker can provide you with many years of service and pleasure. Each wood handle on our pots are turned on a lathe and individually stained (color may vary) and attached to our pots with a brass connectors to ensure leak free use for many years. We also make sure that handles do not wobble and are securely attached. Finally our pots, like all copper cookware, are coated with tin inside which is a healthy metal that is required by our bodies. However, tin is not cheap and some manufacturers mix lead with it. We use only 100% lead free tin inside our pots. Each pot is individually wrapped with cellophane to prevent oxidation before shipment so that it is shiny as our pictures when you get it. CARE : You can use the commercially available cleaning materials for copper or tin to clean your coffee pot if you need to, but remember it's OK to let your pot turn dark. It adds character! Outside: Non abrasive pad or sponge is the best. Inside: Tin is a soft metal and should be cleaned with a dishcloth or sponge only. Never use abrasive cleaning materials like scouring pads or metal scrapers on your coffee pot. Rinse thoroughly after washing and dry to avoid spotting. DEMMEX Turkish Greek Arabic Copper Coffee Pot. Material : 1mm Copper - Food Safe Tin Lining - Wooden Handle. Capacity : 7 Oz, Makes 2-3 Cups of Turkish Coffee. DEMMEX is a Registered US & Turkish Brand. Amazon Best Selling COPPERBULL Coffee Pots are manufactured by DEMMEX,too.